The Battle of Bita Paka was fought at Bita Paka (also spelled Bitapaka), south of Kabakaul, on the island of New Britain, on 11 September 1914 and was as part of the occupation of German New Guinea by the Australian Naval and Military Expeditionary Force shortly after the outbreak of the First World War. As with the New Zealand operation against German Samoa, the target was the strategically important wireless station, being one of several used by the German East Asiatic Squadron under the command of Vice Admiral Count von Spee. The battle was Australia's first major military engagement of the war and the only significant action of the campaign. After landing the Australians were resisted by a mixed force of German reservists and Melanesian native police, who forced them to fight their way to their objective. The wireless stations were captured after a day of fighting. Both forces suffered casualties. 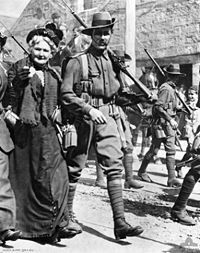 The remaining German forces on New Britain subsequently fled to Toma and after a brief siege there, the garrison capitulated, ending the resistance to the Australian occupation of the island. German New Guinea consisted of north-eastern New Guinea and several nearby island groups that are now entirely part of Papua New Guinea. First established in 1884 the main part of the colony was formed by Kaiser-Wilhelmsland, the north-eastern part New Guinea. 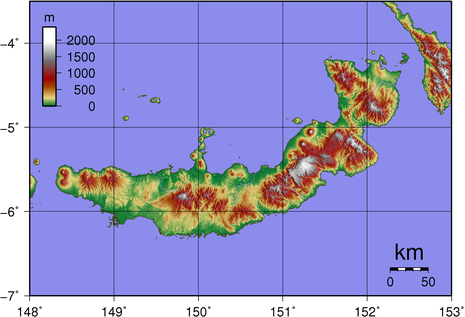 The islands to the east were called the Bismarck Archipelago and consisted of Neu-Pommern (now New Britain) and Neu-Mecklenburg (now New Ireland). With the exception of German Samoa, all German islands in the Pacific were administratively part of German New Guinea: the German Solomon Islands (Buka, Bougainville and several smaller islands), the Carolines, Palau, the Marianas (except for Guam), the Marshall Islands and Nauru. Although a relatively minor colony, it covered an extensive land area, totalling more than 249,500 km². While the western half of New Guinea had been administered by the Netherlands since 1828, the eastern half was not annexed by any European power until the 1880s. In 1883, fearful of growing foreign influence, the British colony of Queensland annexed the south-eastern part of New Guinea, against the wishes of the British government. This initiated German interest in the remaining third of the island and on 3 November 1884, under the newly founded Neuguinea-Kompanie (New Guinea Company), the German flag was flown over Kaiser-Wilhelmsland, the Bismarck Archipelago (formerly New Britain) and the German Solomon Islands. On 17 May 1885 the German Emperor granted an Imperial charter to the New Guinea Company for this annexation, and on 13 November 1886 this charter was extended to the Solomon Islands. On 1 April 1899 the German government formally took control, and the area became a protectorate. A treaty with Spain, signed on 30 July, ensured German control over several island groups in the Pacific, and these were added to the protectorate of German New Guinea. The economic life of German New Guinea’s small population of European and Asian settlers, as well as its indentured native population, relied heavily on the export of copra and the import of goods and services and it remained a modest outpost. Indeed by August 1914 there were only 1,273 Europeans living in the colony, while there was also a small but significant number of Japanese, Chinese and Malays. Following vital training, a small force of the AN&MEF landed at Herberthohe, six miles from the Bita Paka radio station, on 11 September 1914. The Australians advanced towards the station, but ran into a German sniper shortly after embarking. The German was hiding in a tree and looking down the sight of his Mauser when he was spotted without noticing. One of the Australians took a shot and wounded the sniper in the hand, thus rendering it impossible for him to fire his weapon.